The Ohio River LifeBoat Project from the STUDIO’s previous fellow Carolyn Lambert was a four month journey on a customized boat. The LifeBoat hosted potluck dinners to discuss the intersections of recreation and commerce, culture and ecology of the Ohio River. Drawing on the personal stories and memories of towboat captains, swimmers, casino boat pilots, commercial fishermen, power plant chemists, environmental activists, small business owners, and local historians, the project initiated discussions of the river as a shared space. With the floating platform of the LifeBoat, I created a space for interaction and dialogue about the uses of the river. Ohio River LifeBoat Project from Carolyn Lambert. A collaboratively designed houseboat carried the artist Carolyn Lambert and her rotating one-person crew down the river and functioned as a sleeping, cooking and storage space. A solar panel, a water filtration system to drink water directly from the river, a grey water catchment system, and a small herb garden provided self-sustaining support to the compact 172 square feet of living space. The Ohio River is a thoroughfare, a natural resource, a pollution dump, and site of recreation. Beginning in Pittsburgh, the Ohio flows through six states-Pennsylvania, Ohio, West Virginia, Kentucky, Indiana and Illinois. The river is a drinking water source for more than 3 million people. Nine percent of total US energy from coal comes from plants directly on the Ohio River. Over 230 million tons of cargo are transported on the river each year, and most of that is energy related. There are over 112 marinas, yacht clubs and public docks along the Ohio, each representing dozens of recreational boaters and fishermen/women. 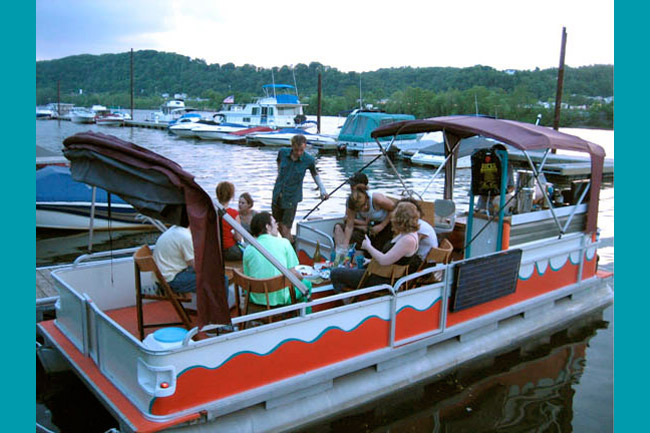 The Ohio River LifeBoat Project was supported by Ford Motor Company, Ingram Barge Company, National Wildlife Fund, Steinbrenner Institute, the Sprout Fund, and the CMU School of Art.